Perhaps you arrived at Mbs because you know exactly what you need, and you’ve heard tell of our innovative gallery hanging systems, our years of experience in the sign and picture mounting business, our unbeatable rates, and our stellar customer service practices. Or, maybe you stumbled upon our picture rail systems by accident and simply thought to yourself – what a great idea! 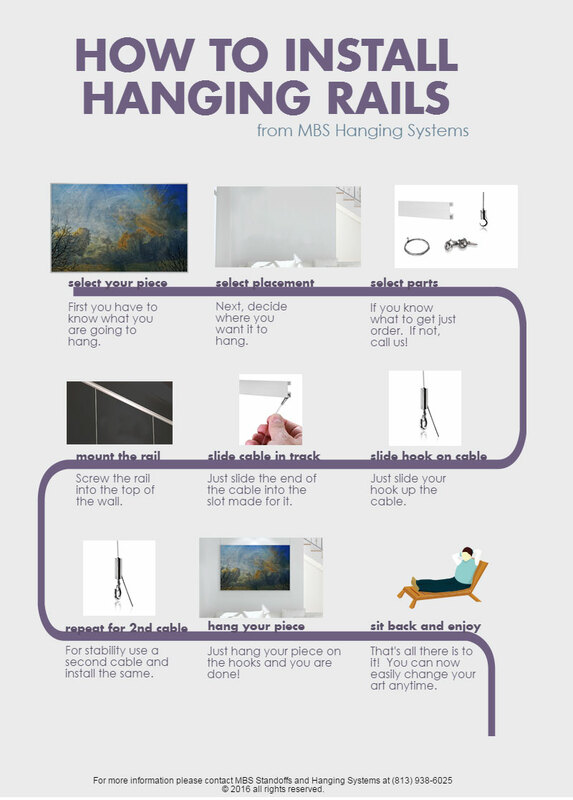 Either way, you may need ideas on how to best utilize your fun, easy new art hanging system. Thanks to the incredible flexibility of all of our systems – including the easy rail, ceiling rail, and classic rail – the options for hanging your artwork are virtually endless. You can create any look you want, and then easily change it up the minute the whim strikes you. Let’s take a look at some fun and distinctive arrangements for your picture hanging system. With our easy rail you can easily hang several smaller pieces, say, two or three on each side, with a larger piece in the center. Use three cables – one for the main centerpiece, and one on each side for smaller pieces, mounted vertically and in alignment with each other, evenly spaced so that the top edge of the top pieces are just above the larger center picture, and the lower edges of the bottom pieces are just below it. Drawing upon a changing seasons theme or various elements of nature will create a colorful visage that touches the soul and evokes memories. If you’ve got a long, narrow room, or a hallway that’s suffering from barren walls, use our easy or classic rail to hang a series of small black and white photographs, either in frames all of equal size, or alternating larger then smaller. Nylon cables are capable of holding this small artwork (up to 15 pounds each) and are nearly invisible, giving the illusion that the pictures are floating. Mount a large photo of mom and dad or grandma and grandpa in the center of a ceiling hung rail, perhaps over the sofa, then mount photos of your children and/or grandchildren at varying heights from other points in the rail. Do not align the surrounding pictures horizontally – this will create the random look meant to mimic the leaves of a tree. Your imagination is the only limit to the possibilities for your picture hanging system. Build your system and get creative!